Hi! I have discussed about inserting json into mysql using php a while back. And I got several queries from readers about inserting multiple json objects into DB using the exact method. Inserting multiple objects involves multiple database transactions. There are less elegant ways to do this but using mysqli library’s Prepared Statement is the effective and secure way for this type of job. Prepared Statements has several advantages like utilizing fewer resources, preventing sql injection etc. I’ll show you here with an example, how to use mysqli prepared statement to insert multiple json data into mysql database in php. First we need to create mysql database required for our example. Run this below sql command to create it. We also need a json file to use for our example. Below is the file ‘empdata.json’ with multiple json objects containing some employee details. We have to read through the above json file and insert the objects (i.e., employee details) one by one into mysql database. 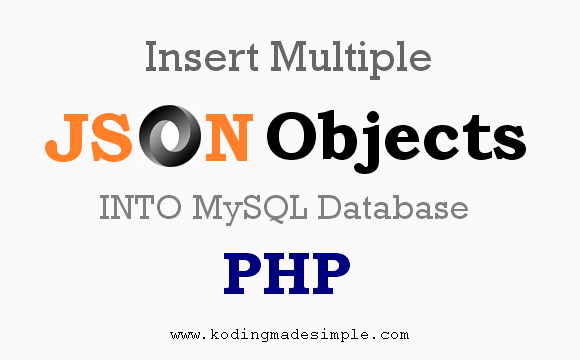 This is the php code snippet for inserting multiple json objects into mysql database. As you can see, first we connect to the mysql database using the statement mysqli_connect(). Next we use prepare statement mysqli_prepare() to prepare the insert query. Since we have to do multiple insertions into the database, preparing the query is quite effective and consumes less database resources. The ? (question mark) in the INSERT query indicates that there are three parameters to be inserted into the database. Next we read the json file and convert the data into php associative array. The method file_get_contents($filename); returns the contents of the file into a variable. And this in turn is converted into array using json_decode() function. Since there are multiple json data to be inserted into the db, we have to loop through the array using foreach statement. And store the employee details into variables and insert them into database using the mysqli_stmt_execute($st); statement. This will execute the insert query we have prepared earlier. Once the database insertion is complete, we have to release the database handle we created at the beginning. The statement mysqli_close($con); will close the opened mysql database connection and empty the handle. That was all about inserting multiple json data into mysql database using php. You can run the above given php snippet and it will insert the json file contents into the database. I hope you like this post. If you like it, please share it in your social circle. what is 'sss' stand for? 's' stands for string data type of the given parameter. Since we have 3 params and all of them ($name, $gender, $designation) are of string type, we have used 'sss'. Hi! What do you mean by null given? '$con' (mysqli handler) is the first param provided in the mysqli_prepare() statement above. Could you help me with one question? How can i get and decode information from several .json files? They have the simmilar structure. What kind of transformation needs code? Hi! If you have all your json files in a folder, then you can read through the files one by one like this. How can I loop through such data? Thank you very much for your support! can you write a tutorial on updating the above provided mysql database with dynamic json using php. i.e add new value but if value exist in database update it. Is there any way to replace all existing values in the mySQL database with the json values ? Hi, great tutorial! I am getting odd behavior though. Only the first letter of each value in my json object is being inserted into my database - the rest of the value is truncated. Any idea what might cause this? Thanks! Hey, im trying to learn how to insert json data into my database, ive copied this code to test run it but nothing is being inserted. is there a specific way to run this php code for it to be inserted? Wrong json formation might be the cause for such behavior. It's hard to find the issue without seeing data. Thanx for the nice tutorial! I need to get some data as single but there are some data that needs to be looped inside loop for example. Like $title and $name are individually specified in data but then parts section has another array of data. So each "interchangenumber" inside parts section needs to be separated.